Designed to supply power to traditional motorhomes, caravans and boats. The ER450 is built for regular mounting conditions and safe gas dispersion by central degassing and spark arrestor. When you choosethe ER450, you'll get a battery that's robust-spill-proof, medium vibration and tilt resistant. It uses built in lead/acid flooded technology with Sb/Ca alloy and central degassing covering a performance range from 350Wh to 550Wh. This is a great choice for classic recreational vehicles. When you choose Exide ER450, you'll travel in luxury and always feel at home. 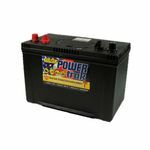 In your motorhome or caravan, you rely on battery power for food preservation, heating/cooling and lots more. With Exide's new ER450, you can rely on everything for much longer. Whether you're a professional installer or a private user, you'll be amazed by the power and endurance of the ER450. And, by selecting the right battery for your needs, your trip can last even longer.